This is a review of Thyroid Response from Dr. Ben Kim. This synergistic supplement containing nutrients and herbs will support your thyroid function. It helps people with hypo- or hyperthyroidism issues. Do you have problems whith your thyroid function? Then this review is written for you. Please read on to learn more about Dr. Ben Kim’s Thyroid Response. selenium: this is important for converting T3. Two pills a day preferably taken in the evening before going to bed. But it is recommended to consult with your doctor before taking the supplement. Pregnant or nursing women should not takes these tablets because of the ingredient ashwaganda. It is unclear if these supplements contain enough of the active ingredients as the daily dosage of most of them have not been established. But then again these are mostly herbs which are not essential to a human diet. The price per jar of 90 tablets costs $ 39.95 but if you buy more than 3 jars the price becomes $37.95 and with more than 6 jars the price goes down to $35.95. A nice discount of $4.00 per jar. Dr. Ben Kim only offers refunds on articles that are in new state. There is no special guarantee on this particular product. The reason they give for this is that they only have small margin of profit on their products, but I would think that if you believe your product works you would give some kind of guarantee. Dr. Ben Kim’s website offers only one review of the article and this was written in 2011, over four years ago! The reviewer was very happy with the product and stated he is now off his regular medication. It is a pity there is only one review as more of them would tell me more about the effectiveness of this supplement. 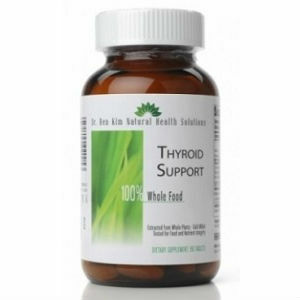 Dr. Ben Kim’s Thyroid Response is an interesting supplement to take when you have thyroid problems. I like that it is all natural. Unfortunately there is nothing to be found on the website to convince me that these tablets actually work. There is no money back guarantee and there is only the one review which is so overstated that one wonders if Dr. Kim wrote it himself. The label on the jar does not offer me any more insight as the daily recommended doses of the ingredients has not been established. Also I find too many warnings that one should consult a physician before taking this supplement. Does this mean it is dangerous? I personally would look for something that gives a bit more certainty when in the market for a thyroid supplement. Lauren Shepherdson	reviewed Dr. Ben Kim Thyroid Response	on August 5th	 and gave it a rating of 2.5.